Waikiki, one of the places to see on multi island Hawaii vacations. A visit to the Hawaii would not be complete until you see all of the islands in the Aloha State. Visiting any one of the major Hawaiian Island can provide you with a memorable vacation. But you could be missing a lot if you don’t experience the completeness and breathe of multi island Hawaii vacations. This is because each island offers attractions and experiences that can only be found there. Here are highlights of what you can expect to see on each Hawaiian Island. They’ll show people why they should take multi island Hawaii vacations. 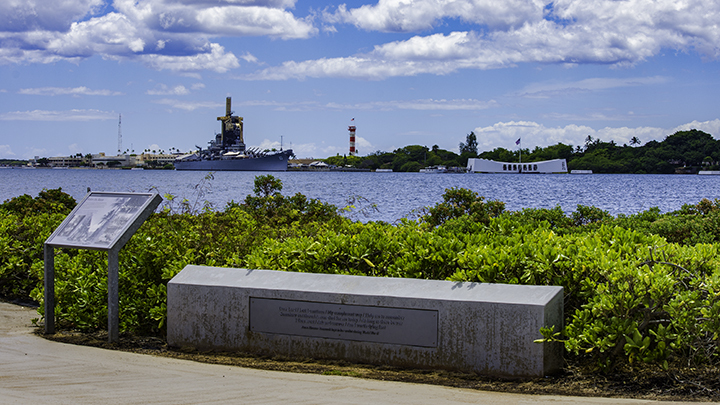 View of the USS Missouri and the Arizona Memorial. 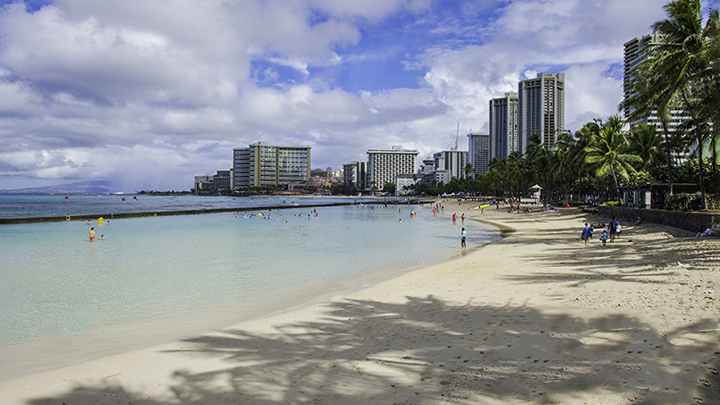 Oahu is the home of Hawaii’s capital and the State’s largest city, Honolulu. Honolulu offers the trappings of any large city. Here, there are a wide range of resorts, great restaurants, shopping complexes and entertainment. But what makes Oahu stands out is that it is surrounded by beautiful beach areas. Here, you can find world renowned areas, like Hanauma Bay, Kailua Beach and Waikiki Beach. And don’t forget about its world class vacation destination area, Waikiki. Away from the city, you can find the North Shore. It annually hosts the most prestigious surfing meet in the world, the Vans Triple Crown of surfing. If you like history and culture, you can find ample opportunities to enjoy them on Oahu. You can find Hawaii’s most visited attraction, the Arizona Memorial in Pearl Harbor. Nearby, you can visit the USS Missouri Memorial, the famous battleship where World War II officially ended. In the Kalihi area of town, you can find the Bishop Museum. It’s arguably the best place anywhere for artifacts and displays about Hawaii’s culture and lifestyle. And if you’re interested in Polynesian culture, there’s no place better than the Polynesian Cultural Center in Laie. The Valley Isle of Maui offers the spectacular Haleakala National Park. 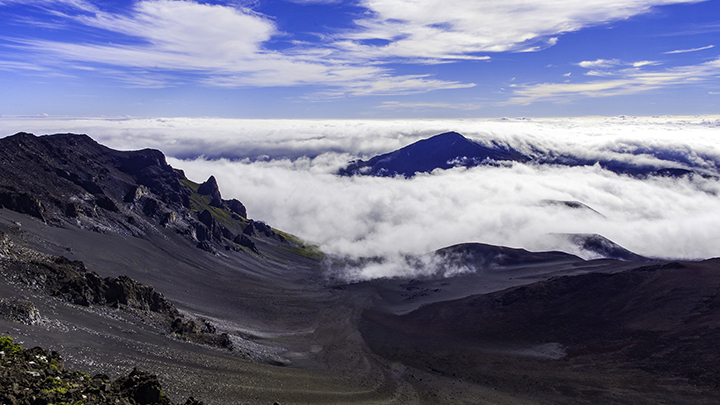 Here, you can drive over 10,000 feet to the scenic summit of the dormant volcano Haleakala. The drive also offers above-the-clouds panoramic vistas of the island. If you drive along the Hana Highway, past Hana, you can also visit the eastern part of Haleakala National Park. This is where you’ll find the idyllic Oheo Gulch area, popularly known as the Seven Sacred Pools. Here, you’ll find beautiful pools, a canopied bamboo forest and stunning waterfalls. On the west and southern sides of Maui, you’ll see the resort areas of Ka’anapali, Kapalua and Wailea. Here, you can enjoy fabulous beach area and 5 star golfing facilities. The town of Lahaina is nearby. In Lahaina, you can experience the charm and history of this once major whaling port. While the whaling industry is long gone, this area is now famous for watching humpback whales. You can see them on their annual migration, during January to March, in this area. The Garden Isle might be the most verdant of all of the Hawaiian Islands. This is because of the rainfall at Mt. Waialeale, one of the wettest spots in the world. Kauai is known for being showcased in many major motion pictures. They include Jurassic Park, King Kong, The Descendants, South Pacific and many more. They offer another reason to come to this island to see areas that were captured in these popular films. 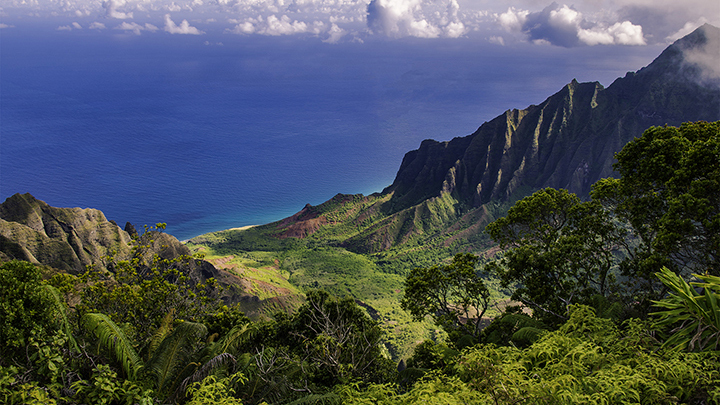 One of those places is the remote, but spectacular, Na Pali Coast, which you can only view by helicopter or by boat. Another picturesque area is Hanalei Bay, where many memorable scenes from South Pacific and The Descendants were shot. Kauai features outstanding opportunities to view nature at its finest. There is the Kilauea Point National Wildlife Refuge. At the refuge, you’ll see a wide range of marine wildlife. They’ll include frigatebirds, Hawaiian monk seals and the endangered Hawaiian nene goose. On the other side of the island, you can find the beautifully hued Waimea Canyon, otherwise known as the Grand Canyon of the Pacific. Here, you can also capture breathtaking views of the secluded and mysterious Kalalau Valley. 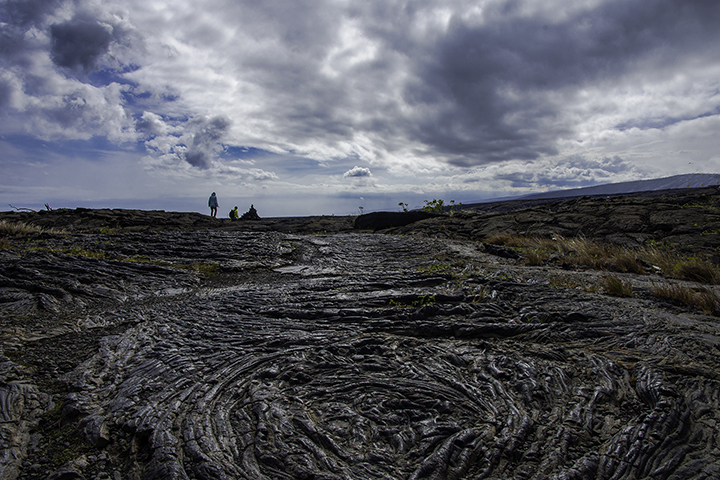 Lava field at Hawaii Volcanoes National Park, one of the places to see on multi island Hawaii vacations. The Big Island has the most national parks and historic parks of all the Hawaiian Islands. You’ll find arguably Hawaii’s most famous national park here, Hawaii Volcanoes National Park. In addition to seeing one of the world’s most active volcanoes up-close, visitors will revel in watching fiery lava flowing to the ocean in an explosive steamy confluence. There are National Park sites on the island highlighting the history and culture of ancient Hawaii. These include Pu’uhonua o Honaunau, Kaloko-Honokohau and Pu’ukohala Heiau National Historical Parks. In addition to the national parks, you can also behold the world’s tallest mountain, if measured from its base on the ocean in the form of Mauna Kea, as well as the world’s most massive volcano in the form of Mauna Loa. The Big Island also hosts a number of annual world class events. The town of Hilo hosts the Merry Monarch Festival during Easter. The event showcases the best hula from Hawaii as well as anywhere else in the planet. There also is the Ironman World Championship, open only to the best triathletes in the world, held in the town of Kona each October. It’s fairly easy to do multi island Hawaii vacations. This is because there are 3 inter island carriers that serve the Hawaiian Islands. They are Hawaiian Airlines, Island Air and Mokulele Airlines. Each carrier offers numerous daily flights throughout the day for travel between all or most of the islands. The flights are very short with the longest being no longer than an hour.